They say you can’t make an omelette without breaking a few eggs. Sticking with kitchen metaphors, I’d like to go so far to say, you can’t become a chef without cutting a few fingers (true story). We chefs have all got our “war stories”, scars of varying sizes and shapes mapping out our journey with the blade. But as inevitable as cuts, scrapes and burns are in the kitchen, it’s amazing what a difference cutting with the right knife can make. This is my personal favourite collection of knives and what I like to use them for. As the name suggests there’s no better all-purpose knife than the cook’s knife. Picking it up immediately makes you feel in control. It’s an undoubted confidence booster and can be used for chopping, mincing, slicing and dicing. Whenever I decide to treat myself to a steak tartare, my cook’s knife is the first and only thing I reach for. When cutting meat, rest your guiding hand on the steak with the tips of your fingers tucked safely away from the knife. Rest the side of the blade against your knuckles and slice. For steak tartare, slice the steak into thin slivers and then mince it into tiny pieces. They say if you want to test a knife’s sharpness, slice a ripe tomato. If the knife glides through it virtually undetected, the blade is in great shape. A utility knife is just as versatile as a cook’s knife, but much easier to use when chopping or slicing medium-sized produce, like tomatoes and onions. When cutting tomatoes for a braaibroodjie, slice against the core so the “spokes” (from the interior wall separating the two chambers) keeps the slice intact. Position the knife where you want to cut the tomato, being sure to pierce the skin of the tomato before letting the blade glide all the way through. I try not to get (too) pedantic about most things, so the idea of a knife dedicated solely to the cutting of sausages seemed excessive to me at first – kind of like driving gloves. But its compact size and serrated blade means it’s perfect for cutting any food with a hard or firm skin – not just sausages, but also fruit, vegetables, bread and even cheese. Serrated blades should be approached with caution, as they have a whole row of sharp teeth ready and willing to cut through any kind of skin. When cutting chorizo, slice it at a slight angle into elongated ovals, keeping your fingers well clear of the blade. The Santoku is a cook’s knife with an edge (hey, I couldn’t resist). It originated centuries ago in Asia as the go-to knife for preparing sushi and sashimi, but has since become a global culinary staple. The characteristic hollows in the blade create air pockets when slicing, meaning the food releases from the blade easier, and the wider, thinner blade makes the Santoku knife ideal for finer cutting tasks. When cutting a sweet potato (or any root vegetable, for that matter) in the Hasselback style, steady it with the bottom of your palm and tuck your fingers away from the knife. 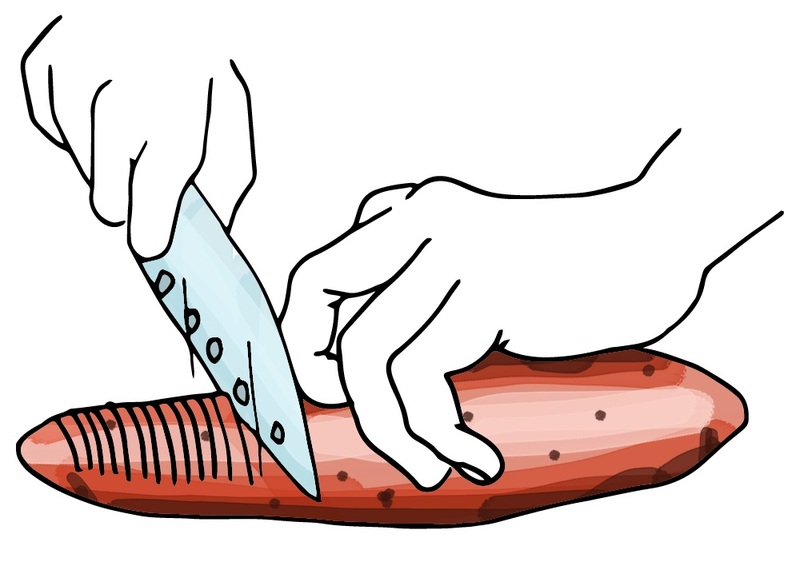 Rest the side of the blade against your knuckles, slicing the sweet potato ¾ of the way down. When going into the oven to bake, the oils from the butter and olive oil seeps into the thin slits sliced into the sweet potato, leaving the skin crispy and the flesh soft and creamy. The finer the brush, the more detailed the work. In many ways, a knife is to a chef what a brush is to an artist, and when it comes to detail work – like julienning or peeling a variety of fruits and vegetables – there is no better option than the paring knife. It’s small, so it’s easy to handle, and its pointy tip is perfect for testing the tenderness of vegetables. Whether peeling an orange in your hand or slicing its skin into thin slivers on a cutting board while preparing marmalade, go at your own pace. Speed comes with experience – it’s what you’re left with that matters. Make sure your grip is comfortable and secure. A good paring knife is well balanced and feels just right in your hand, no matter at what angle you hold it. Everyone I know owns a bread knife, whether their cooking skills begin and end with frying an egg or whether they own three restaurants. For this reason, I think it’s one of the most overlooked knives in the kitchen. The name trivialises how useful it really is, in my opinion. If you called it a serrated knife, for instance, people would take it far more seriously. Like the sausage knife, it’s great at cutting through tough skin, and its size means you can take on anything, from a dense rye bread to an oversized watermelon. Not many people know this, but the best way to cut a watermelon is with a sharp bread knife. Place one hand firmly on the side of the watermelon to steady it. When cutting the watermelon open, cut through the skin first and let the knife guide you the rest of the way through. When cutting the fruit into wedges, always keep your guiding hand well clear of the elongated blade. In the end, you’re only as good as the tools at your disposal. And although choosing the right knife for the task can elevate your cooking to new heights, keeping them sharp is even more important. A blunt knife can be dangerous, as you have to use more force to get it to do its job. Keep it sharp and it will do most of the work for you. But more importantly, when food is evenly cut, it cooks more evenly. Simply put: when it’s cut well, it cooks well.